There’s nothing better than a quick and easy dinner. Well, except for one that’s rich and delicious too! This Easy Avocado Lemon Basil Pesto is one of my favorites from my book and is one of the easiest of the bunch! Don’t let the specialty basil intimidate you. If you don’t have lemon basil, you can use regular basil. Just add some lemon zest, extra lemon juice or another lemon herb like lemon verbena or lemon balm. 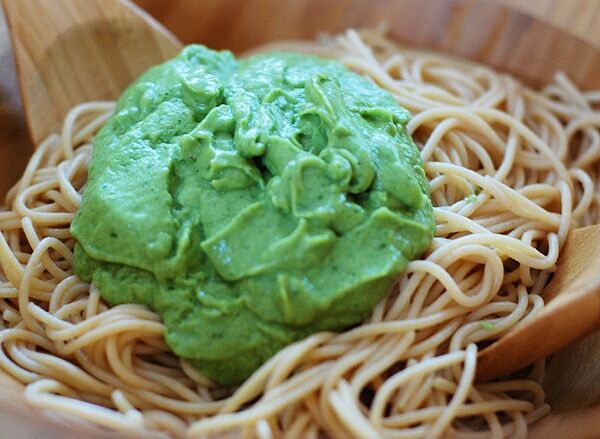 This pesto comes together in minutes, so put your pasta in the boiling water while you make the pesto in your blender. It will be ready to toss with your piping hot, perfectly cooked pasta. You’ll be out of the kitchen before it has time to get too hot! 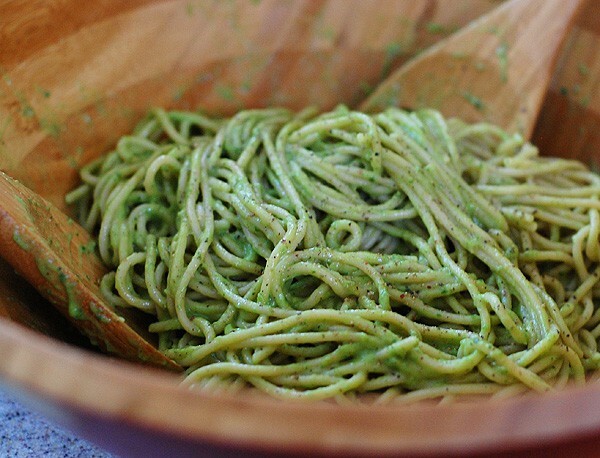 This pesto also feels like it has a little magic in it too. 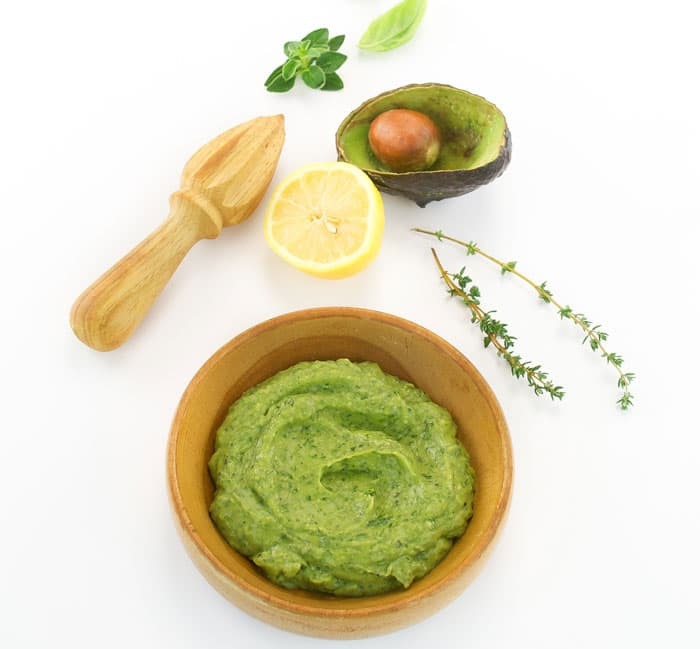 It has no added oil, but is silky smooth from the pureed avocado and has a big punch of flavor from the fresh herbs. It’s amazing the flavor you can get out of just a few ingredients mixed together. If by chance, there are any leftovers, put it in the fridge and call it pasta salad the next day and eat it for lunch. Don’t let the specialty basil intimidate you. If you don’t have lemon basil, you can use regular basil and add lemon zest, extra lemon juice or another lemony herb like lemon verbena or lemon balm. This rich, creamy pasta sauce comes together in minutes and has a bright lemon and herb flavor. 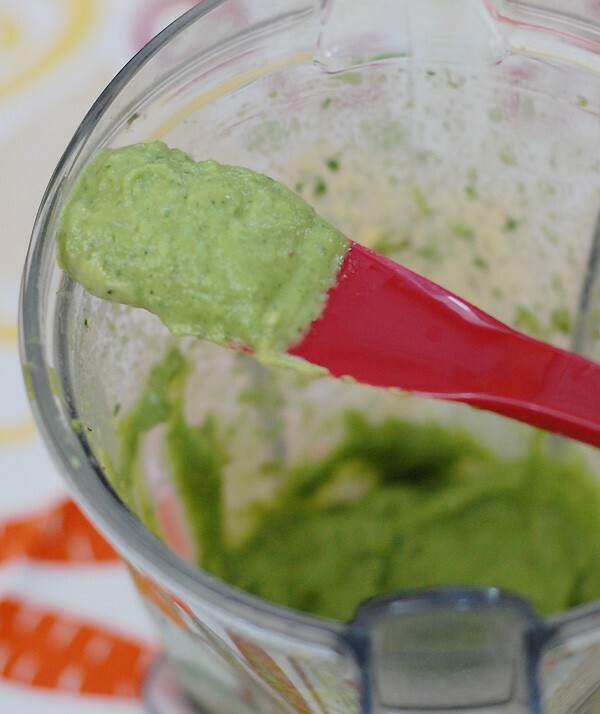 Put the avocado flesh, lemon basil, leaves only from the thyme, oregano, lemon juice, salt and water in a blender and blend well until the herbs are pureed. If the puree is still too thick, add 2 more tablespoons of water and blend again. Toss with 1/2 pound cooked whole wheat angel hair pasta. 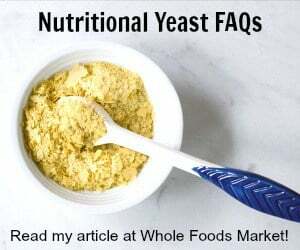 I absolutely LOVE this recipe for all the reasons you listed – healthy fats, super creamy and rich, and delicious. I made it last year using butternut squash noodles and it was divine. I was growing lemon balm so took your advice and it worked like a charm. This year I’ll use regular basil and more lemon juice/zest. Just bought a squash and some avocado…can’t wait!! It’s recipes like this that I crave and look forward to that make eating healthier fun and easy to share. First off, this recipe looks AMAZING Kathy. 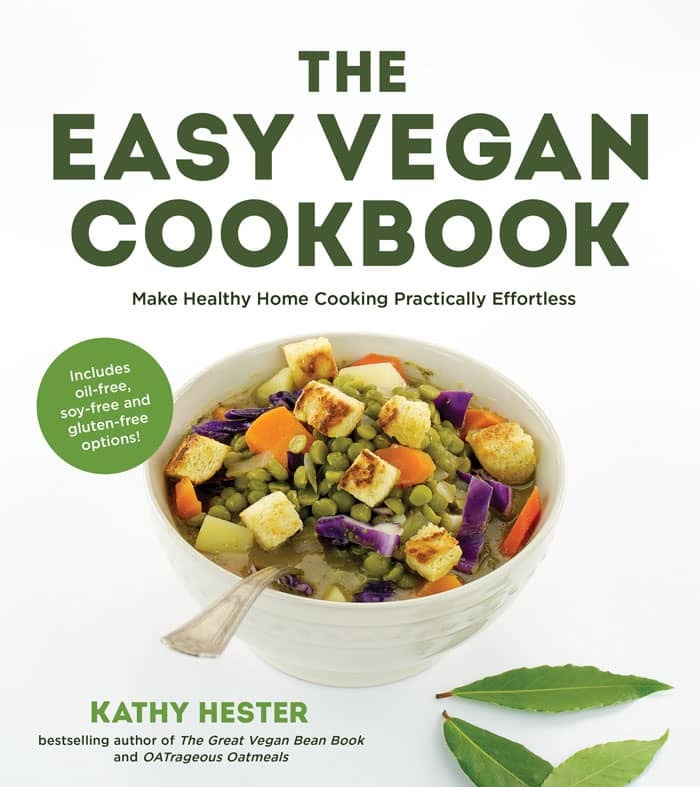 Second … serious coincidence … I just wrote and finalized edit on a review of your cookbook for Allergic Living magazine – got a sneak preview and loved it! I only had room for one new cookbook review in print, and yours won hands down. That’s the best news ever!!! Thank you so much. Fantastic recipe. I particularly love that you instruct us to just use the leftovers as lunch as a pasta salad, honestly I think I might like that way first. This pesto sounds delicious. I love the avocado and basil combination! This would be great on a pasta dish. This is brilliant! Have almost everything on hand, really looking forward to diving into this awesome combination of flavors.Congrats on the new cookbook too! Great use of avocado and basil in this recipe. The flavors seem amazing and I can’t wait to try the recipe for myself. Made this tonight & we loved it! I do grow lemon basil, I added some of my parsley too, only had dried oregano so used 1/4 tsp. My salt is Maine Coast sea salt-kelp. So fresh & creamy. Looking forward to the little bit left for lunch tomorrow, which I’ll eat cold. Yum! I always freeze pesto for use throughout the year. 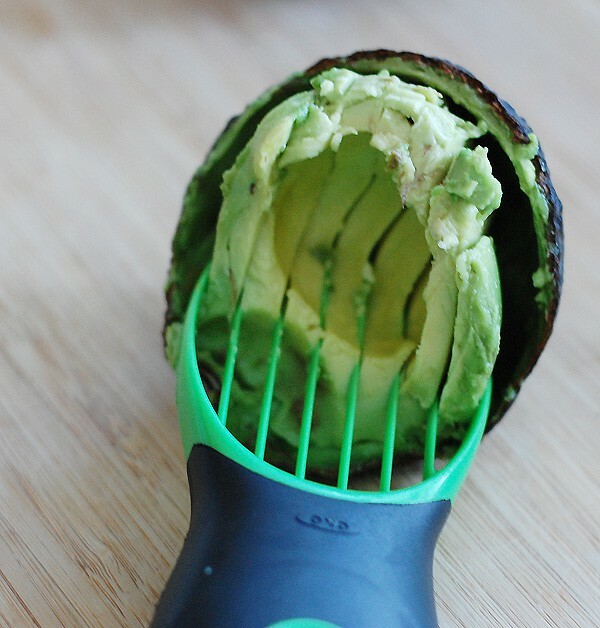 With the avocado, would this freeze ok? Yes, it should freeze great.